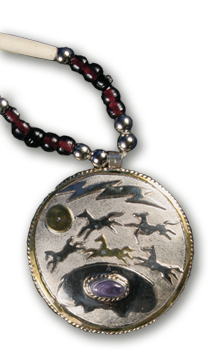 Each of the 28 days in a 13-moon Lakota calendar represents a sacred tradition or belief in the culture. Wakáŋ Táŋka, as Grandfather, is the Great Spirit independent of manifestation, unqualified, identical to the Christian Godhead, or to the Hindu Brahma-Nirguna. Wakáŋ Táŋka, as Father, is the Great Spirit considered in relation to His manifestation, either as Creator, Preserver, or Destroyer, identical to the Christian God or to the Hindu Brahma-Saguna. Makhá - Earth - is considered under two aspects, that of Mother and Grandmother. The former is the earth considered as the producer of all growing forms … whereas Grandmother refers to the ground or substance of all growing things —potentiality. When the Lakota people do anything sacred, they see the world as having four directions. From these four directions come the four winds. Each direction has a special meaning and color associated with it. The cross symbolizes all directions. Wanbli - eagle - is a winged symbol for the Lakota people. It is the strongest and bravest of all birds. For this reason, the eagle and its feathers have been chosen as a symbol of what is highest, bravest, strongest and holiest. Wí - sun - enlightens the entire universe. As the flames of the sun come to us in the morning, so comes the grace of Wakáŋ Táŋka, by which all creatures are enlightened. It is because of this that the four-leggeds and the wingeds always rejoice at the coming of the light. We can all see in the day, and this seeing is sacred for it represents the sight of that real world which we may have through the eye of the heart. The growing and dying of the haŋhépi wí - moon - reminds us of our ignorance which comes and goes; but when the moon is full it is as if the eternal light of the Great Spirit were upon the whole world. Morning Star, there at the place where the sun comes up, you who have the wisdom which we seek, help us in cleansing ourselves and all the people, that our generations to come will have light as they walk the sacred path. The four steps represent, to the Sioux, the four ages or phases of a cycle: the rock age, the bow age, the fire age, and the pipe age. The rock, bow, fire, or pipe constitutes the main ritual support for each age. The four ages may also refer, microcosmically, to the four phases of a man’s life, from birth to death. When a Lakota smokes a sacred pipe, his or her voice is sent to Wakáŋ Táŋka - the Great Spirit. A central part of each sacred rite is smoking the sacred pipe. Phéta - fire - represents the great power of Wakáŋ Táŋka, which gives life to all things. It is as a ray from the sun. Miní - water - represents the great power of Wakáŋ Táŋka, which allows renewal of life to all things. Iŋyaŋ - rock - represent Grandmother Earth, from whom all fruits come, and they also represent the indestructible and everlasting nature of Wakáŋ Táŋka.